You can eat corn one of two ways. There’s the typewriter style, where you chomp away length-wise and there’s the spinning style, where you go at it, twisting the ear of corn as you eat. Everyone knows this. Well, everyone except Michael Buble. He knows how to croon, sure, but I’m slightly concerned that he doesn’t know how to eat an ear of corn. There is exhibit A, a photo taken in Disneyland. 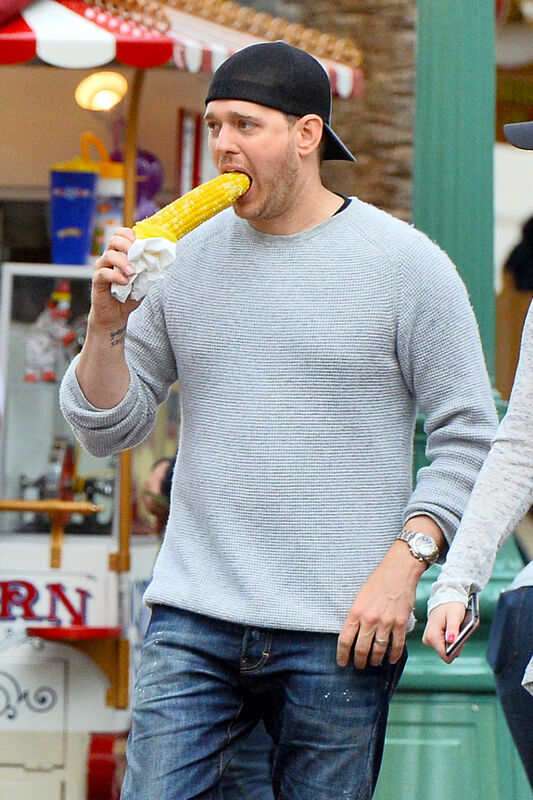 The singer is tackling an ear of corn in the same way you’d go at a delicious ice cream cone… Or, uh, something else. What are you doing, Michael Buble? That style doesn’t even make sense logistically. How are you going to get to the corn in the middle of the ear? Well, I guess you could… Never mind. It’s not a banana, Michael Buble. It’s not a rocket pop, Michael Buble. It’s an ear of corn. Hey, Gloria Starr, trainer of etiquette, how do you properly eat an ear of corn? What are you doing, Michael Buble? And why do you look so sad? Are you sad because you’ve never eaten an ear of corn before and are self-conscious about it? That would make sense. It certainly looks as if you’ve never eaten an ear of corn before. It also looks like you’ve never been to Disneyland before.